Anantamul, also referred to as Sariva or Indian Sarsaparilla, has a wide range of uses from rejuvenation and nourishing the tissues, to cleansing and detoxifying the body. Its robust red color indicates the powerful effect it has on the blood, specifically to cool and purify this vital tissue. Its variability in actions allow it to treat a plethora of disorders including all skin disorders (acne, eczema, psoriasis, etc), infertility, miscarriage, inflammation, excessive heat, toxins, low energy, low libido and so much more. In fact, Anantamul’s versatility can also be seen in its ability to treat all three doshas (Vata, Pitta, Kapha) simultaneously. 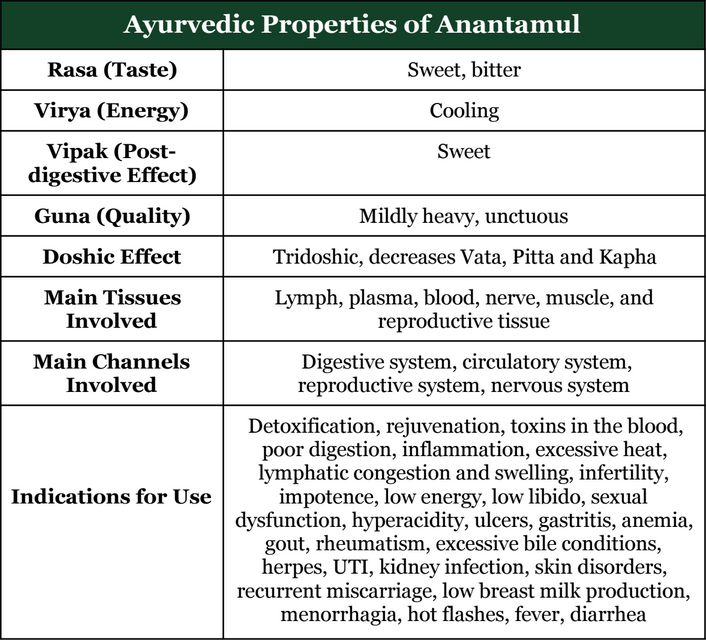 There are many detoxifying, blood cleansing herbs out there, but Anantamul is one of my favorites, as it is gentle enough to use for people of all ages, all dosha types and all stages of health (or disease). Often an individual may need to remove toxins from the system, but in fact is too depleted for some of the more harsh detoxifiers such as Neem and Kutki. 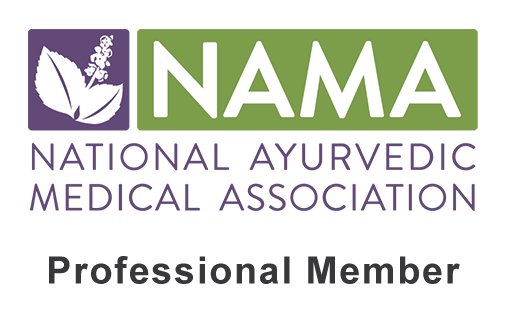 Anantamul is not only a great choice for detoxification in these situations, but will also aid in increasing the vital energy (Ojas) and rejuvenating the system at the same time. Although Anantamul can be used in both men and women alike, it is clearly a leader in women’s health issues. It acts specifically on the reproductive organs and its gentle nature allows it to be utilized during all stages of womanhood, including pregnancy. In fact, it is traditionally used during a woman’s entire pregnancy to strengthen the fetus and help prevent miscarriage. Whether treating fertility issues, recurrent miscarriage, menopausal symptoms, irregular cycles, UTIs or low libido, Anantamul is a great option… But don’t get me wrong, Anantamul is equally as effective in treating male infertility, impotence, low libido and poor sperm count/quality too! For Women: Mix 1/4 tsp of Anantamul, 1/4 tsp of Shatavari, 1/4 tsp of Vidari and 1/4 tsp of ghee in 1/2 cup of warm water. This can be taken three times daily before meals. If available add in a small pinch of Pippali powder to each dosage. For Men: Mix 1/4 tsp of Anantamul, 1/4 tsp of Ashwagandha, 1/4 tsp of Bala and 1/4 tsp of ghee in 1/2 cup of warm water and take three times daily before meals. **Alternatively, both men and women can take 1 tsp of Rasayana Ghrita melted in 1/2 cup of warm water, twice each day (morning and before bed). Take 1/4 tsp of Anantamul, 1/4 tsp of Bala, 1/4 tsp of Shatavari, a small pinch of ginger, 1 tsp of honey and 1/2 tsp of ghee, mixed in 1/2 cup of warm milk (substitute with Almond or Hemp Milk). Take this twice daily, once in the morning and again before bed. Take 1/4 tsp each of Anantamul, Neem, Manjistha, and Guduchi, mixed in 1/2 cup of warm water, three times daily before meals. **Alternatively one can take the Daily Detox Blend in the same dosages. Take 1/2 tsp of Anantamul and 1/2 tsp of Bala mixed in 1/2 tsp of ghee and 1/2 tsp of honey. Wash down with warm water. This should be taken in the morning (before food) and again around 2-3pm. 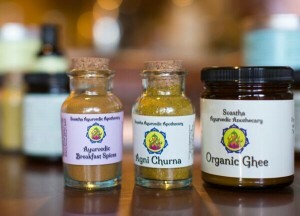 **Alternatively, one can take 1 tsp of Rasayana Ghrita mixed in 1 tsp of honey. This should be taken in the morning (before food) and again around 2-3pm. Take 1/2 tsp of Anantamul and Brahmi (blend 1:1) mixed in 1/2 cup of warm water. If needed you can also add in 1/4 tsp of ghee to each dosage. This can be taken three times daily after meals. Take 1/4 tsp each of Anantamul, Fennel (powder) and Guduchi, with a pinch of Pippali powder and 1/4 tsp of ghee. This should be taken consistently up to 30 minutes before each meal. 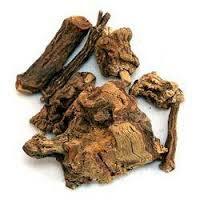 Take 1/4 tsp each of Anantamul, Licorice and Shatavari, with 1/8 tsp of Kamadudha (if available). Mix this in warm water and take before each meal. **This should be done simultaneously while taking a Pitta-reducing diet. Before I discovered ayurveda, I took this as a liquid supplement in water for my psoriasis! Awesome!